For most of us, the basis of our lives is an ordinary one. We have to understand that the definition of “ordinary” is perceived differently from one person to another. Regardless of the perception that “ordinary” has, it is impossible for each and every person to be the same. 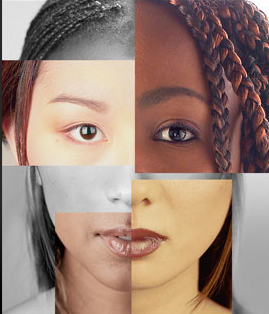 The common thread in “ordinary” is that (most likely within our environment and society) ordinary people will blend. If when living your ordinary life, you don’t settle for riding the wave and become content with blending in, but instead you thrive on doing things with determination and integrity... well…that’s what makes you an extra-ordinary person. Your daily routine filled with kindness, genuine interest and love weighs heavier than an out-of-the-norm burst of gentleness. 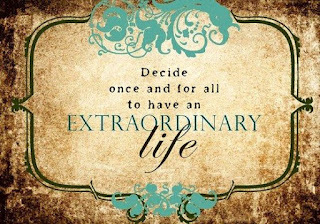 Being extraordinary is putting forth the best of you in anything and everything you want, or try to achieve it; being a great mom, being a great spouse/partner, being a great friend, or even being a great employee. Although I consider myself at times more fortunate than others around me, (allowing me to rate my life as successful in terms of emotion versus accomplishments), I still realize that I’m deficient in many areas compared to some others. Nevertheless, my accomplishments in life and the way I go about achieving them or working on them makes me extraordinary. My disposition makes me understand that I’m not “better than” or “less than,” but that I should just live the life that I have in the most positive, focused and purposeful way I can. This will still be true, even if the only person I impact is myself and direct family. Impacting and performing for an audience will weigh the same as if it’s for self or one person; the action (its effect and the depth) is what makes you extraordinary, not your audience. In conclusion, we should all know that however uneventful our lives can be, we all have the capacity to live an extraordinary life. Any level of success requires work and motivation, heart and strength. To be extraordinary is to conquer your fears and opposition; it is to be content and appreciative of where you are and to be the best and live the best you can under all circumstances. How about you? Is your life filled with extraordinary tales, moments…? 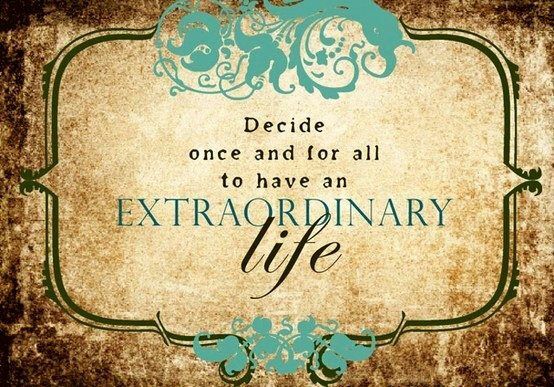 Do you recognize and enjoy YOU being extraordinary (as you know you are! )?